Compute: What You Leave Behind? As always our final set of benchmarks is a look at compute performance. As we mentioned in our discussion on the Kepler architecture, GK104’s improvements seem to be compute neutral at best, and harmful to compute performance at worst. NVIDIA has made it clear that they are focusing first and foremost on gaming performance with GTX 680, and in the process are deemphasizing compute performance. Why? Let’s take a look. Our first compute benchmark comes from Civilization V, which uses DirectCompute to decompress textures on the fly. Civ V includes a sub-benchmark that exclusively tests the speed of their texture decompression algorithm by repeatedly decompressing the textures required for one of the game’s leader scenes. 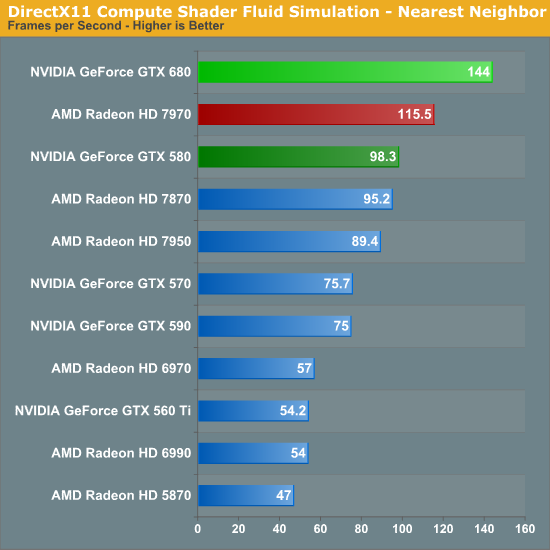 Note that this is a DX11 DirectCompute benchmark. Remember when NVIDIA used to sweep AMD in Civ V Compute? Times have certainly changed. 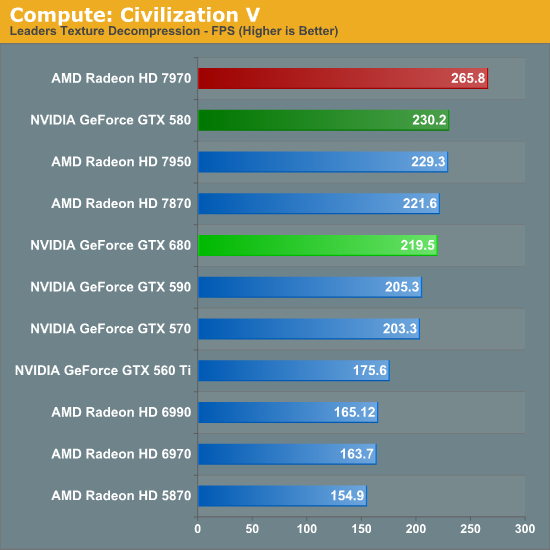 AMD’s shift to GCN has rocketed them to the top of our Civ V Compute benchmark, meanwhile the reality is that in what’s probably the most realistic DirectCompute benchmark we have has the GTX 680 losing to the GTX 580, never mind the 7970. It’s not by much, mind you, but in this case the GTX 680 for all of its functional units and its core clock advantage doesn’t have the compute performance to stand toe-to-toe with the GTX 580. At first glance our initial assumptions would appear to be right: Kepler’s scheduler changes have weakened its compute performance relative to Fermi. 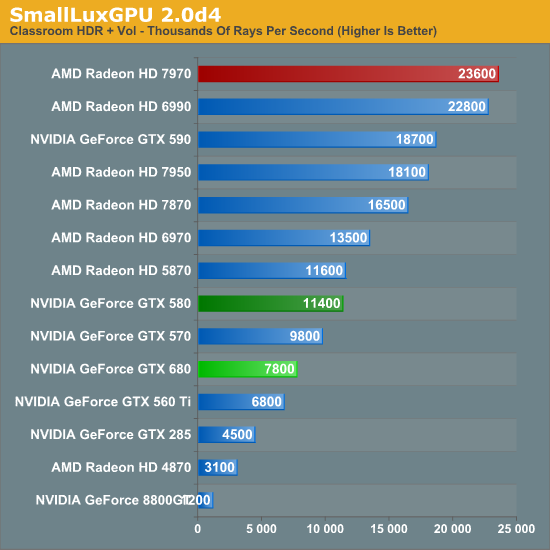 Our next benchmark is SmallLuxGPU, the GPU ray tracing branch of the open source LuxRender renderer. We’re now using a development build from the version 2.0 branch, and we’ve moved on to a more complex scene that hopefully will provide a greater challenge to our GPUs. CivV was bad; SmallLuxGPU is worse. At this point the GTX 680 can’t even compete with the GTX 570, let alone anything Radeon. In fact the GTX 680 has more in common with the GTX 560 Ti than it does anything else. On that note, since we weren’t going to significantly change our benchmark suite for the GTX 680 launch, NVIDIA had a solid hunch that we were going to use SmallLuxGPU in our tests, and spoke specifically of it. Apparently NVIDIA has put absolutely no time into optimizing their now all-important Kepler compiler for SmallLuxGPU, choosing to focus on games instead. While that doesn’t make it clear how much of GTX 680’s performance is due to the compiler versus a general loss in compute performance, it does offer at least a slim hope that NVIDIA can improve their compute performance. 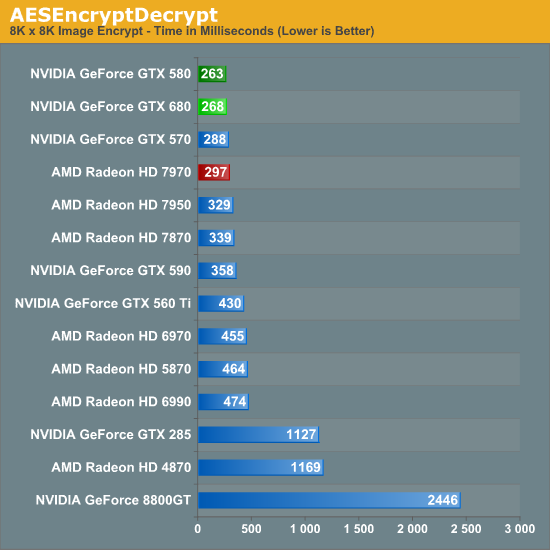 For our next benchmark we’re looking at AESEncryptDecrypt, an OpenCL AES encryption routine that AES encrypts/decrypts an 8K x 8K pixel square image file. The results of this benchmark are the average time to encrypt the image over a number of iterations of the AES cypher. Starting with our AES encryption benchmark NVIDIA begins a recovery. GTX 680 is still technically slower than GTX 580, but only marginally so. 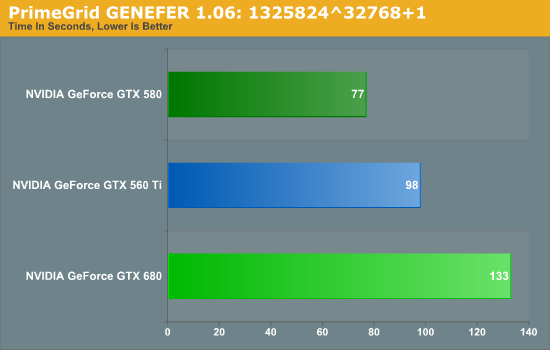 If nothing else it maintains NVIDIA’s general lead in this benchmark, and is the first sign that GTX 680’s compute performance isn’t all bad. For our fourth compute benchmark we wanted to reach out and grab something for CUDA, given the popularity of NVIDIA’s proprietary API. Unfortunately we were largely met with failure, for similar reasons as we were when the Radeon HD 7970 launched. Just as many OpenCL programs were hand optimized and didn’t know what to do with the Southern Islands architecture, many CUDA applications didn’t know what to do with GK104 and its Compute Capability 3.0 feature set. To be clear, NVIDIA’s “core” CUDA functionality remains intact; PhysX, video transcoding, etc all work. But 3rd party applications are a much bigger issue. Among the CUDA programs that failed were NVIDIA’s own Design Garage (a GTX 480 showcase package), AccelerEyes’ GBENCH MatLab benchmark, and the latest Folding@Home client. Since our goal here is to stick to consumer/prosumer applications in reflection of the fact that the GTX 680 is a consumer card, we did somewhat limit ourselves by ruling out a number of professional CUDA applications, but there’s no telling that compatibility there would fare any better. We ultimately started looking at Distributed Computing applications and settled on PrimeGrid, whose CUDA accelerated GENEFER client worked with GTX 680. Interestingly enough it primarily uses double precision math – whether this is a good thing or not though is up to the reader given the GTX 680’s anemic double precision performance. Because it’s based around double precision math the GTX 680 does rather poorly here, but the surprising bit is that it did so to a larger degree than we’d expect. The GTX 680’s FP64 performance is 1/24th its FP32 performance, compared to 1/8th on GTX 580 and 1/12th on GTX 560 Ti. Still, our expectation would be that performance would at least hold constant relative to the GTX 560 Ti, given that the GTX 680 has more than double the compute performance to offset the larger FP64 gap. Instead we found that the GTX 680 takes 35% longer, when on paper it should be 20% faster than the GTX 560 Ti (largely due to the difference in the core clock). This makes for yet another test where the GTX 680 can’t keep up with the GTX 500 series, be it due to the change in the scheduler, or perhaps the greater pressure on the still-64KB L1 cache. Regardless of the reason, it is becoming increasingly evident that NVIDIA has sacrificed compute performance to reach their efficiency targets for GK104, which is an interesting shift from a company that was so gung-ho about compute performance, and a slightly concerning sign that NVIDIA may have lost faith in the GPU Computing market for consumer applications. Finally, our last benchmark is once again looking at compute shader performance, this time through the Fluid simulation sample in the DirectX SDK. This program simulates the motion and interactions of a 16k particle fluid using a compute shader, with a choice of several different algorithms. In this case we’re using an (O)n^2 nearest neighbor method that is optimized by using shared memory to cache data. Redemption at last? In our final compute benchmark the GTX 680 finally shows that it can still succeed in some compute scenarios, taking a rather impressive lead over both the 7970 and the GTX 580. At this point it’s not particularly clear why the GTX 680 does so well here and only here, but the fact that this is a compute shader program as opposed to an OpenCL program may have something to do with it. NVIDIA needs solid compute shader performance for the games that use it; OpenCL and even CUDA performance however can take a backseat. If you think overclocking RAM (which you imply but which isn't necessarily even true) makes that big of a difference than overclocking the GPU then you are fooling yourself. The GPU does the work, not the ram. What does a fast number cruncher mean, if it's busy waiting on the numbers? "The GPU does the work, not the ram." 1. You overclocked your Graphics Card, but only the core and not the memory. You ran a benchmark and let's assume you got a score of 100. 2. Now, you overclocked your memory and ran the same benchmark again. You got the score of 101. This is what actually happens in MOST cases. It doesn't happen always. Why it doesn't happen always? Answer:- If you use extreme methods and take your core clock too high the memory will become a bottleneck. Cosider that you try to overclock using Liquid Nitrogen. 1. After overclocking only the core clock to the maximum. 2. You overclock your memory too. In this case the memory was holding back the GPU Core from operating at it's full potential. But this does not happen if don't use extreme methods. Actually the 79xx series is the 1st time in a very long time amd has had a lead, let alone a lead of 20%, let alone "leap frogging". Amd has been behind since the GTX8800 and I don't know how long before that. Let's face it, the 79xx for 2.5 months was the 1st time amd played Frogger in a long time and made it across the street without getting flattened before stepping off the curb. Sorry but the 7970 is still much faster in crysis min fps, which I would argue is more important then average. It's faster in Metro as well. All things considered, the 7970 stands up against the 680GTX well. It loses in everything to 680 including 3 monitor performance. That's not standing up well, it's larger, hotter, and slower at everything, with far less features and it's $60 bucks more. More features I'm sure you fans of the loser underdog don't care about as of 9 am this morning.